In this bedtime story, Owl is ready for bed, but as soon as he settles in, he hears a strange noise. He'll never get to sleep unless he can figure out what is making the noise! He looks everywherein his cupboard, underneath the floorboardseven in his walls. But while he's busy tearing his house apart, he doesn't notice one tiny, squeaky, mouse-shaped detail... Will Owl ever get a good night's sleep? 2017 Theodor Seuss Geisel Honor Book, bold illustrations with deliciously bright colors produced with printmaking techniques reminiscent of an earlier time, hilarious and easily relatable bedtime story for kids of all ages, descriptive words and bright oversized fonts makes reading fun. 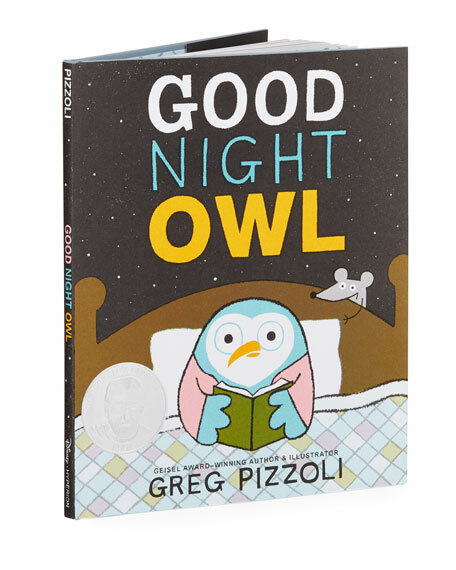 8.25"W x 0.25"D x 10.25"T.
Pizzoli's Good Night Owl is a modern twist on the classic tale of not wanting to go to bed. 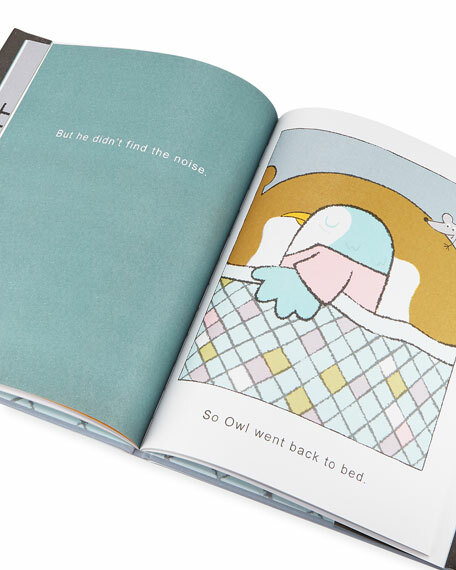 Teaching the importance of learning to accept things beyond one's control, the Owl Soft Toy stays true to Pizzoli's colorful illustrations with beautiful pastel blue plush, yellow beak and a fluffy pink robe. With Noise by his side, these Pizzoli characters are a heartwarming example that friendship comes in all shapes and sizes. These two character toys stay together nicely with a grip-strap tab. Detachable, interactive friends in the spirit of Greg Pizzoli's hilarious and heartfelt illustrations, based on Theodor Seuss Geisel Honor 2017 book "Good Night Owl" by Pizzoli.